After a poor show at the Dubai sevens, Kenya showed dramatic improvement at the Cape Town sevens which was held only one week after the Dubai sevens debacle. Kenya topped their group, shocking South Africa 14-12, drawing with England 19-19 and beating Zimbabwe 36-0. The emphatic win over Zimbabwe is telling: During the 2016 Olympic qualifiers, Kenya almost lost to Zimbabwe in the final. Had it not been for a last grasp individual by effort by Dennis Ombachi, Kenya would have lost to the Zims. Indeed Kenya looked disjointed in that match. There was marked improvement in the Cape Town sevens. 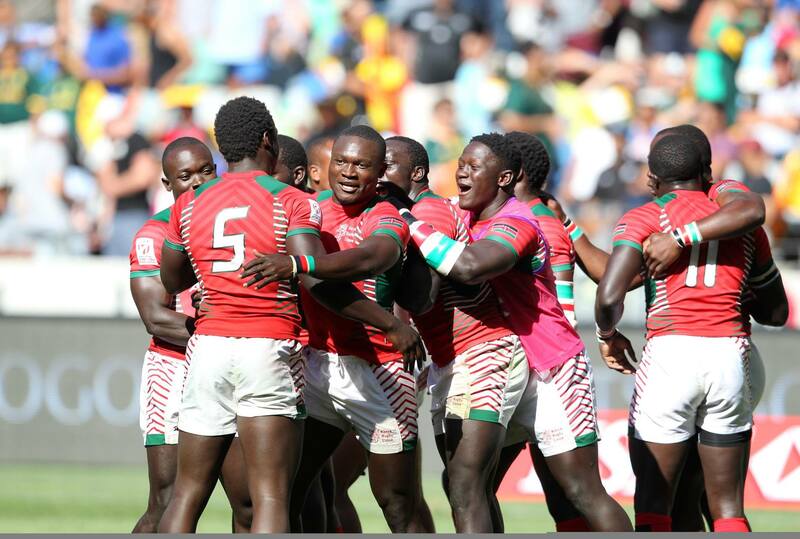 Kenya’s play was far more composed and their ability to string together several phases showed a marked improvement. After topping their group, Kenya faced a strong USA side that had upset New Zealand. This USA team under former Kenya coach Mike Friday has given Kenya nightmares over the past 2 years, winning most of their matches against Kenya. But Kenya were in no mood to be intimidated. What won the game against USA was their ferocious commitment to force turnovers either on rucks, kickoffs or line-outs. Kenya scored three tries in the first half. All three came from forced turnovers. The first came when Kenya with a ferocious ruck, forced a turnover that freed Injera for an easy try. Then Will Ambaka stole a lineout and barged over the tryline. Kenya then stole a kickoff and swung the ball left finding Ambaka who grabbed a high pass, shrugged off an illegal undercutting tackle from a USA player and touched down. Against Argentina, Kenya came from behind, trailing 24-10 and scored two tries in the last minute to narrow the gap to 24-22. Biko Adema was forced to take a conversion from a difficult angle and he almost converted it, only to see his effort hit the post, thus denying Kenya two points that would have tied the game and forced it into extra time. Both Willy Ambaka and Oscar Ouma made glorious returns and played well. Ambaka is still very dangerous when given any space. Ouma is still very adept in gaining ground with the ball, shrugging off would be tacklers and offloading to runners. Nelson Oyoo, a new player, played on the wing. When given opportunitities, he showed good speed down the flanks that resulted in tries. His ability to reach the tryline will ensure him a good future on this team if he continues to grow. Kenya’s defence is still below par. Kenya gives attackers to much space to maneouvre because when the other team gets the ball, they do not rush the defence and instead retreat backwards. This gives opposing attackers more room to run at the defence, commit defenders and offload to open finishers. This cost Kenya two tries against USA and was the primary reason they lost to Argentina. Kenyan centers such as Oscar Ayodi allowed opposing runners far too much space. Kenya’s penchant for giving attackers space to set up their moves is a stark contrast to their ferocity at breakdowns. What Kenya defenders need to do is immediately close down attackers as soon as they receive the ball. Kenyans are naturally fast and should use their speed to their advantage on defence. Against Argentina, Kenya scored a late try which should have tied the game and sent it to extra time. Frank Wanyama who scored the try, actually had an opportunity to touch down closer to the goals in order to make the conversion easier. Instead he immediately dove for the tryline. Some of this is because of nerves, some due to inexperience and some is due to lack of focus. Wanyama then went on to celebrate with his dance not realizing his error until an official pointed it out to him near the touchline. This entry was posted in Kenya Rugby News and Commentary, Kenya Sports news and commentary and tagged Kenya Rugby Sevens. Bookmark the permalink.